“Advent of New Proletariat” – they’re coming. 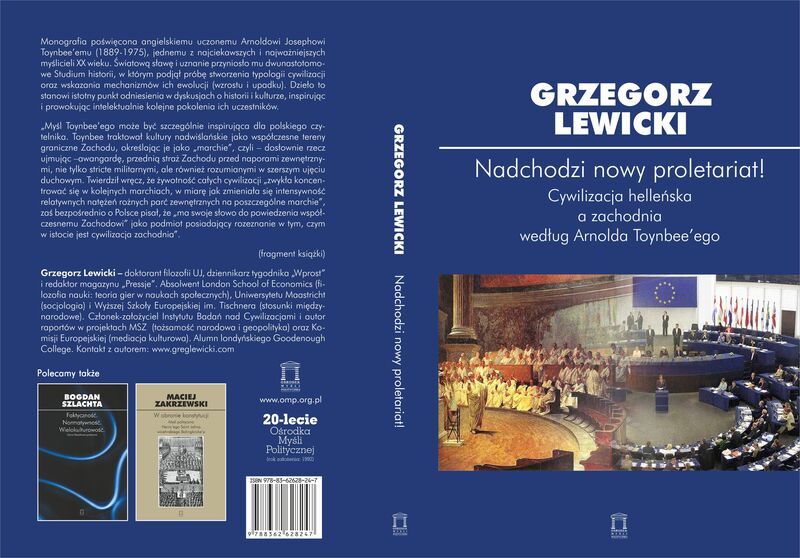 My new book on Toynbee, history and Europe available now in Polish. I invite you to have a look at my new book “The Advent of New Proletariat”, available now (in Polish) in selected bookshops. The subtitle of the book: “Hellenic and Western Civilization according to Arnold Toynbee” tells more about the content: I critically analyze Toynbee’s model of the rise and collapse of civilizations to check whether his view on Antiquity could be useful for an European here and now to shed some light on the dynamics of (post)modernity. Indeed, selected categories by Toynbee might be useful in describing what is going on with the European Union. It is argued that the sociological notion of “internal proletariat” – a social group that technically belongs to a given civilization but in fact despises or ignores some of its core values might be an interesting point of departure to study modern EU. In the final chapter I claim that three systems of beliefs: Christianity, Islam and Non-religion are currently competing for converts in the EU by offering different “boundary concepts” – that is to say different visions of human relation to fate, chance, God and infinity. From these differences different visions of the desired social and political order follow. What is interesting in some places the three systems overlap, which leaves space for creative syntheses as well as for total misunderstanding.